AIM: To lead students to discover how Nehemiah responded when he learned of a need, and to encourage them to pray about and get personally involved in a need this week. Before class: Read the notes on Nehemiah 1 – 2 found in the Sunday School Teacher Book. Write the following lesson outline on the marker board, chalkboard, or a large sheet of paper you can display on the focal wall. Leave out the underlined words. Add them in as you deal with each point during the lesson. INTRODUCTION (Create Learning Readiness): Ask: “How do you respond when you learn of a need?” That is a very broad question, so ask the students to silently answer the following specific questions. Tell the students in today’s lesson we are going to learn how Nehemiah responded when he learned of a need. Ask: “What was last week’s lesson about?” (the Jews put away their foreign wives and pledged to live by God’s Law). Ask if any volunteer would be willing to recite last week’s memory verse (1 John 1:9). Using the Timeline of Ezra, Nehemiah, and Esther, remind the class that Zerubbabel led the first group of 50,000 Jews to return to Jerusalem in 538 BC and rebuilt the Temple. Ezra led a second group of 4,000-5,000 back to Jerusalem in 458 BC. He beautified the Temple and called the people back to faithfulness toward God. The date Nehemiah gave in verse 1 was November or December of 446 BC. 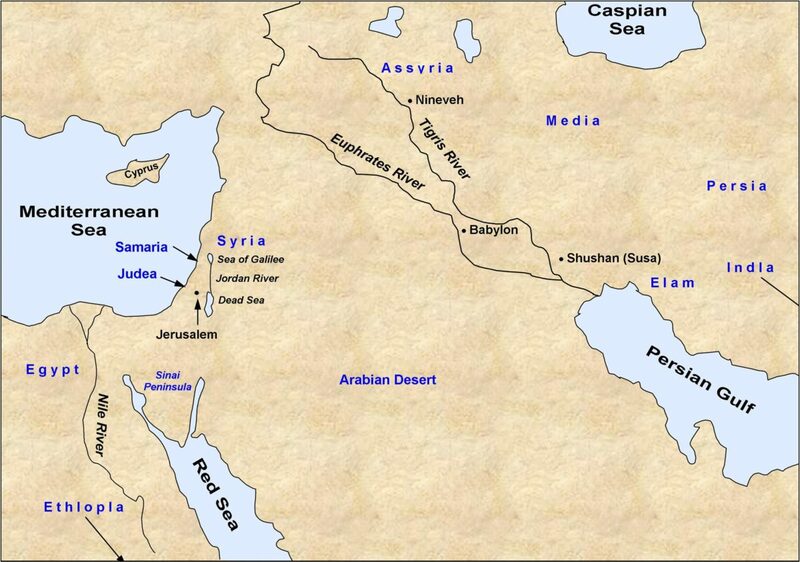 Nehemiah was the cupbearer (see verse 11) to Persian King Artaxerxes in the palace at Shushan (locate Shushan on the map). Nehemiah Learned of a Need. Tell the class Nehemiah learned of a need, and write the word “need” in the first blank on the lesson outline. Ask: “What need did he learn about?” (the Jews in Judea were in great affliction and Jerusalem was defenseless since its walls and gates were broken down). Tell the class the Babylonians destroyed these walls and gates in 586 BC. The Temple had been rebuilt 70 years earlier, but the walls were still broken down. Summarize: Nehemiah learned that the people of Jerusalem were in desperate need because they had no city walls and gates. Nehemiah’s Burden Caused Him to Pray About the Need. Ask a volunteer to read Nehemiah 1:4. Ask the students how Nehemiah responded to this great need (he wept, mourned, fasted, and prayed). Write the word “prayed” in the next blank on the lesson outline. Ask the class to listen to what Nehemiah said to God as you read Nehemiah 1:5-11. Nehemiah confessed and identified with the sins of the Israelites – verses 6-7. Nehemiah reminded God of His promise to re-gather the Jews from captivity and settle them safely in the land – verses 8-10. Nehemiah asked God to grant him mercy in the sight of the king – verse 11. Summarize: Nehemiah was burdened about the sad situation in Jerusalem so he prayed to God. He asked God to forgive their sins and that the king would be merciful to him. Nehemiah Asked the King to Let Him Go Meet the Need. Tell the class the date was March or April of 445 BC. Stress the fact that when Nehemiah learned of the need he became burdened, which drove him to pray. In fact, he prayed about this need for four months. Ask: “Why do you think it mattered that Nehemiah had not been sad in the presence of the king?” (because in ancient times it was a dangerous thing to be sad in the presence of the king, as evidenced by the last sentence in verse 2). Ask a volunteer to read Nehemiah 2:3-5. Tell the class the king asked what Nehemiah wanted. Ask: “According to verse 4, what did Nehemiah do before making his request to the king?” (he prayed to the God of heaven). Ask: “What did Nehemiah ask the king?” (to send him to Jerusalem to rebuild the walls). Tell the class Nehemiah wasn’t satisfied to pray, send money, or even lobby Congress; he wanted to get personally involved. Explain that the king granted Nehemiah’s request, even giving him letters to give him protection and provide needed building materials. Ask: “According to verse 8, why did the king do these things?” (because God’s hand was upon Nehemiah). Write the word “king” in the next blank on the lesson outline. Summarize: After praying about the need in Jerusalem for four months, Nehemiah asked the king’s permission to go there and rebuild the walls. Nehemiah Got Personally Involved in Meeting the Need. Tell the students that Nehemiah went to Jerusalem. As soon as he got there he inspected the city walls. Write the word “inspected” in the next blank on the lesson outline. Nehemiah found the walls and gates broken down, just as had been reported to him. Ask a volunteer to read Nehemiah 2:17-18. Tell the class in these verses Nehemiah challenged the people. Write the word “challenged” on the lesson outline. Ask: “What did he say to the people?” (“Let’s rebuild the walls”). Ask: “How did the people of Jerusalem respond?” (they enthusiastically agreed to build the walls and they got ready to work). Explain that Nehemiah withstood opposition by trusting in God. Summarize: Nehemiah went to Jerusalem, inspected the walls, and challenged the people there to build the walls. Tell the class that is the way it is with us, too. When we learn of a need that we care about we become burdened. That burden drives us to prayer, and out of that prayer often comes a desire to get personally involved to help meet the need. Tell the students we obviously can’t get personally involved in every need we hear about, but as the questions in the introduction of this lesson revealed we are more likely to get personally involved the closer a need is to our heart. Ask: “Do you know of a need that burdens you, moves you to prayer, and in which you can get personally involved?” Tell the class one need that should burden us is the spiritual condition of our lost family members, friends, and co-workers. Their spiritual condition is far worse than the physical condition of the Jews in Jerusalem in 445 BC. We should be burdened that unless they repent and trust Jesus Christ they will spend eternity in hell. Ask: “Who do you know that needs to know Jesus? Are you burdened about that person? Will you pray for him or her? Will you get personally involved in trying to meet that need?” Lead a closing prayer of commitment to pray for and get personally involved this week. CONCLUSION: Ask everyone to memorize Nehemiah 2:20. Encourage them to pray about and get personally involved in meeting a need this week.